Whether you love Halloween or loathe it, the occasion is growing in popularity. For many, Halloween is a spine-chilling spectacular and night of unlimited sweets. For others it is simply overwhelming and intimidating. Whether you favour the full-on horror-fest or will be locking your front door and switching the lights off, read on to find out how everyone can get the best out of the spookiest night in the calendar. Most parents’ worst worry at Halloween is simply that their child will eat too many sweets. However Halloween can also be a time of burns and falls, and sadly, car accidents. In fact, data from America suggests that you are twice as likely to be hit by a car at Halloween than any other night of the year. 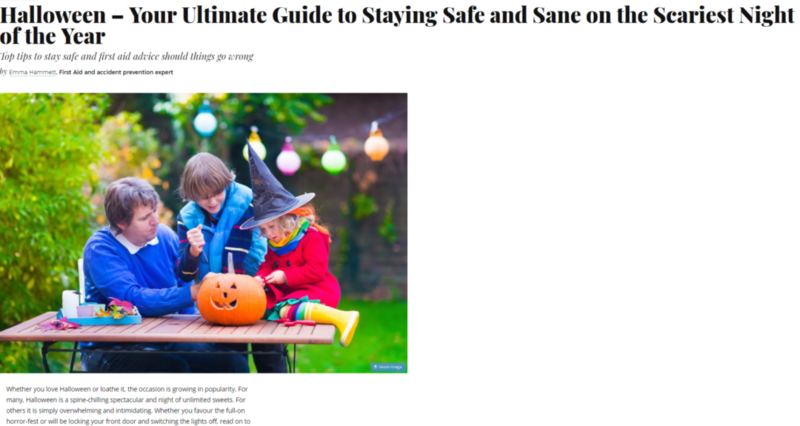 Happily our top tips will ensure you keep you and your family safe at Halloween and the evening is memorable for all the right reasons. Encourage your child to design their pumpkin, but let an adult take charge of the carving to avoid accidents and slips with a sharp knife. If you have younger children, head out early at dusk so you can be home and safe inside before older revellers go out, as some of their costumes can be sinister and possibly provoke nightmares. Masks can restrict a child’s vision making it difficult for them to see hazards such as other people, obstacles, naked flames, cars and bikes. Try non-toxic face paint instead. Make sure it is fully removed at the end of the night to avoid irritation. Ensure costumes fit well and don’t pose a trip hazard, such as a long dress. Footwear should be comfortable and secure. Avoid high heels or ill-fitting shoes. Make sure costumes aren’t restrictive, but allow your child the full range of motion in case they fall or slip. Be aware long capes can be stepped on by others and could choke the wearer. They can also dangle into naked flames and pose a major fire risk. Add your children’s name and your contact number in the costume, in case they get lost and hold their hands securely. Better still, if they are old enough, get them to remember your mobile number by heart. Fancy dress costumes are usually neither warm or waterproof. Wear warm clothes underneath and be ensure you do not to get too cold. Take a waterproof in case it rains. Fancy dress costumes are not subject to the usual flame-resistant regulations and many are extremely flammable. Be extremely careful to avoid naked flames and be aware of any floaty or dangling parts of the costume that could pose an additional fire hazard near lit candles. If your child is carrying a prop such as a sword or axe, make sure it is rubber or soft plastic so it will bend if the child falls onto it. Take a torch or flashlight. Most phones have a torch function. Ensure everyone’s phone has sufficient charge. Opt for light coloured costumes or ones with fluorescent markings so your children (and you) are more visible in the dark. Add reflective tape to the front and back of dark outfits, so your children can be clearly seen by motorists and cyclists. Or wear glowing wristbands or necklaces. Increase your visibility by putting your sweets in a white plastic bag or white pillowcase. Be aware that the sweets being offered may not be the freshest or most hygienic. Discard anything unwrapped or even slightly unwrapped. Do check any sweets or drinks before you let your child consume them. Don’t eat anything homemade unless you are confident you know who made it. If your child has a nut allergy screen all the sweets yourself. You can’t guarantee the homeowner will have remembered to do this. If your child has a nut allergy get them used to speaking up about it. Remember that hard sweets, popcorn, chewing gum can be a choking risk to excited children. Don’t let your child run with sweets in their mouths. Lollies have been known to go right through the child’s hard palate if they fall on them. Always hold little one’s hands and be prepared in case they panic and run if something scares them. Don’t crisscross the road when visiting houses. Instead walk up one side of the street, cross the road carefully in a group, and then visit the houses on the opposite side of the road. Trick or Treating often takes place alongside busy roads where a panicked child could easily get hit by a car. Calmly reiterate road safety rules before you set out. Carry the child’s sweet stash for them. A child who drops a sweet in the middle of the road may not think twice about bending down to pick it up, regardless of what’s coming. Supervise your children and regroup after each visit to make sure you stay together. Ask an adult to be in charge of doing a quick headcount. The unwritten rule of Halloween is if a house owner welcomes visitors they place a lit pumpkin so it is clearly visible from the road. If there are no decorations and no lit pumpkin, assume the people living there do not wish to be visited and move on. If you are in a large group, stagger the flow of children to the door so the home owner isn’t swamped all at a once. 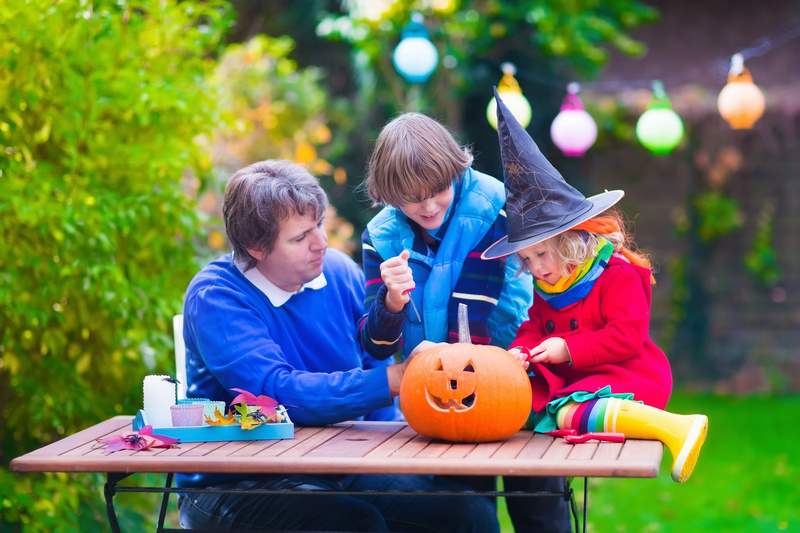 Many people such as the elderly or those with autism don’t enjoy Halloween as they find it overwhelming, intimidating and scary. Parent’s or very little ones can find the noise and excitement extremely irritating when trying to put babies and younger children to bed. Explain this to your child and remind them to be polite and sensitive to others. Encourage children to say thank you for the sweets. The paradox of Halloween is that it breaks all the usual parenting guidance and turns ‘Stranger Danger’ rules on their head. This is the night we encourage children to accept sweets from people they don’t know and to open the door to strangers. Remind children they shouldn’t go with anyone they don’t know. They shouldn’t get into anyone’s car they don’t know. And they should never enter a strangers house. Don’t take shortcuts across peoples garden, there may be obstacles such as clothes lines or hazards such as ornamental ponds you can’t see in the dark. It is also just rude! Stick to the designated path. Make sure they stick in a group of at least three. Ensure they have your contact number and each other’s contact number so they can call you in an emergency and can regroup if they become separated. Work out a short and safe route with them. Ask them to stick to it. Agree a designated meet-up or return time. Set the alarm on their phone to remind them or make sure they have a watch. Remind them about road safety as when they are in an excited group they can often cross roads without concentrating. Inspect their sweets and drinks on their return before they consume anything. Make sure your doorway is well lit. Clear away trip hazards such as wet leaves, garden hoses or children’s play equipment. Ensure sure there are no naked lights or flames around. Instead of putting a tea light in a pumpkin use a battery-operated candle or LED. Be aware some children have nut allergies so try and avoid giving out those sweets. Or have alternatives such as stickers. Be aware peak trick or treating times are between 5.30 pm and 9.30 pm. Allow plenty of time for your journey and be extra vigilant especially in residential areas. Be prepared for children running out from between parked cars or across the road without looking. Always enter and exit driveways cautiously. Follow these guidelines to ensure safe family fun. Happy Halloween everyone. Visit www.onlinefirstaid.com for more information about our award-winning online learning. To read the full Halloween article click here.